Black Rhino is very nice Cannabis Hybrid thats packed with awesome genetics. This strain contains a massive blend of Indica's Afghan White Widow, Northern Lights, Ortiga Indica and Hash Plant. 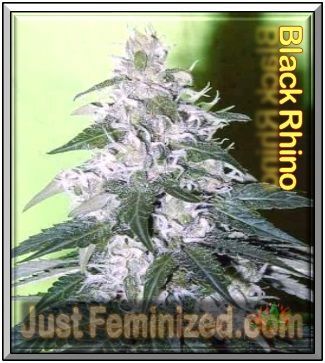 Black Rhino grows with a typical Indica structure, which is short and very bulky. The plants grow with fat fan leaves and super dense crystal covered buds. This is certainly one to try for the Indica Lovers with near 100% Purity from the hash making countries of the world. The high will be intense with a full body couchlock releiving all the tension of pain you may have. When ordering Pick n Mix Seeds Single from us we will send original breeders packaging unless you specify otherwise. If you order before 3pm Monday to Friday we offer guaranteed same day dispatch (subject to availability). We keep all our Pick n Mix Single Marijuana Seed Bank Cannabis Strains in a commercial fridge to preserve quality. Every pack is dated on the day it arrives to us and all products over 18 months old end up in our Discounted Clearance Section to guarantee we only hold fresh marijuana seeds.